By Shelley Lacey-Castelot, ATACP, M.S. with Eve Kessler, Esq. Students with learning disabilities have benefited tremendously from the technology boom of the past few decades. As Assistive Technology continues to evolve, students are utilizing it in new and different ways to help even the playing field. 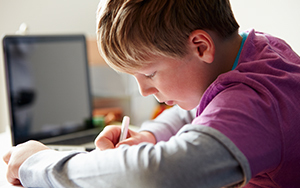 To figure out how technology can best help your child, you must begin with an AT evaluation. An AT evaluation should be done by a professional or team of professionals, which often includes an independent evaluator, knowledgeable about the specific needs of the child. The evaluator should have experience and training in AT devices, services, and implementation, and know how to integrate the technologies into the curriculum through the IEP. What Goes Into an AT Evaluation? Following the assessment, the evaluator will prepare a report containing recommendations, which should be shared with everyone on your child’s team. Together, you will decide which suggestions to accept, include them in the IEP, and then begin the process of implementation. Shelley Lacey-Castelot is the Director of Literacy Solutions in Oxford and Norwalk, CT, and is an expert in the evaluation and use of AT for students with LD and ADHD. Eve Kessler, a criminal appellate attorney with The Legal Aid Society, NYC, is co-founder of SPED*NET, Special Education Network of Wilton (CT) and a Contributing Editor of Smart Kids.